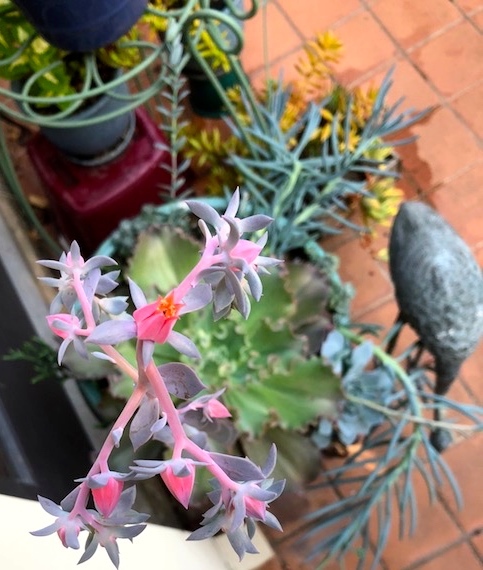 Four conspicuous plants: the central Echeveria ‘Blue Curls’, with its tall flower stalk (up to the height of the doorknob last week, now 2 inches above it, with a base wider by an inch as well); the little silver rosette Echeveria, with its 2-foot+ flower stalk; the two sturdy Senecio (blue chalksticks) stems, with thin flower stems at their tips; and (in the upper right corner) a crassula stem still working up to budding (but now with several offsets, not visible in this photo, at its base). The Senecios. 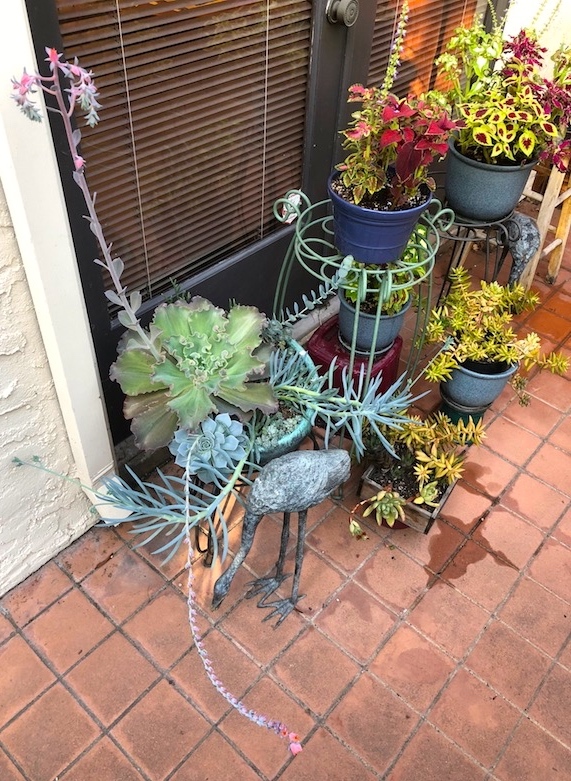 My original thought was that these plants with silver-grey fleshy-fingered leaves were the South African native S. serpens, widely used as a ground cover in desert gardens in Australia and the American West (locally, all over the cactus garden at Stanford), but they’ve gotten awfully big for that. So probably the closely related species S. mandraliscae. 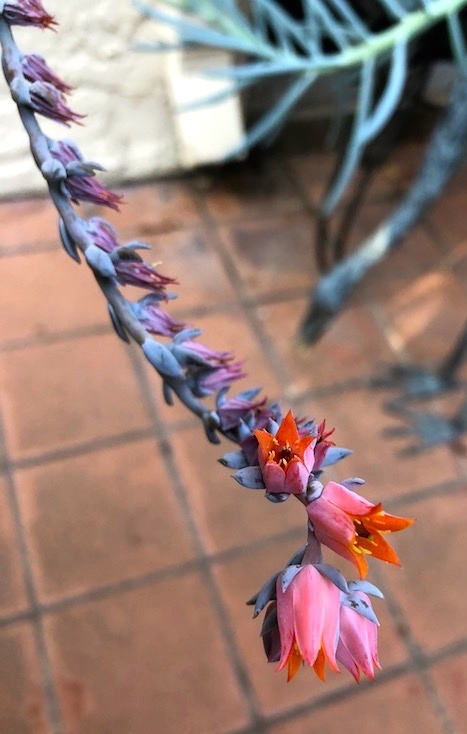 S. mandraliscae: Succulent shrubby perennial … 1 – 1½ ft. high [other sources say to 3 ft.] … Cylindrical, slightly curved, striking blue-gray leaves to 3½ in. long. S. serpens: This species resembles S. mandraliscae, but it is a smaller plant [under 1 ft.] with smaller leaves. mandraliscae for Count Enrico Mandralisca (fl. 1878), Italian nobleman, benefactor, and art collector in Sicily. 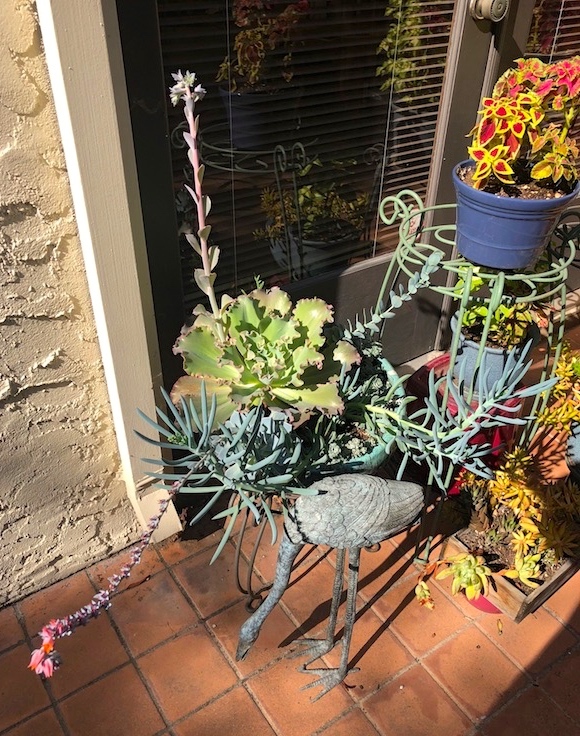 This entry was posted on September 25, 2018 at 12:17 pm and is filed under Language and plants, My life, Names. You can follow any responses to this entry through the RSS 2.0 feed. You can leave a response, or trackback from your own site.